The works of Edward Abbey have been well known to general readers since the 1960’s. This volume, the first comprehensive collection of literary criticism devoted to the entire challenging corpus of Abbey’s fiction and nonfiction, couldn’t be more timely or significant. From the perspective of his scholarly critics in Western American literature and environmental studies Ed Abbey is, in a word, problematic. As Peter Quigley, volume editor, comments, "The title of this collection refers to a number of references within Abbey’s work. The maze is a place of myriad canyons, of wonder, and a place where the desperadoes in The Monkey Wrench Gang could lose the authorities. The coyote refers to the slippery figure in Native American myth, a figure, known to Abbey, that always eluded definition an could slip out of every trap set to catch him." 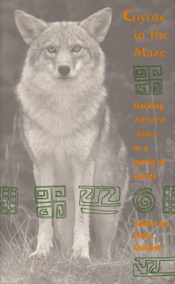 In this long-awaited anthology, eighteen intrepid scholars have chosen to ignore the coyote’s reputation, tracking Abbey in one masterful and illuminating essay after another through the canyons of anarchist politics, philosophy, feminist literary criticism, post-structuralism, and rhetoric, as well as nature and environmental theory and activism. Peter Quigley is an editor of the journal Jeffers Studies and chair of the Humanities and Social Science Department at Embry-Riddle Aeronautical University. The Politics of Leisure: "Industrial Tourism" in Edward Abbey's Desert Solitaire ~ Joseph A. Papa, Jr.